Curse of the Mark Teixeira Curse? On June 11 last year, the Red Sox wrapped up their eight straight victory over the Yankees, prompting team owner John Henry to tweet “The MT curse?” Since then, the Yankees gave gone 13-2 against the Red Sox, while winning a World Series along the way. Let the conspiracy theories commence. Oh Henry! 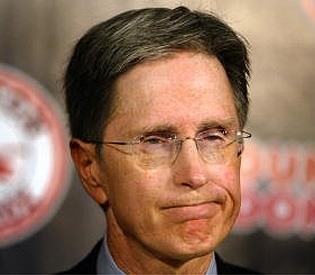 Did Red Sox owner John Henry unleash a new curse via Twitter? At the time, Mark Teixeira didn’t have much say, offering only “How old is Mr. Henry? There’s no reason to get into it with a 70-something-year-old man about baseball.” Tex may have been unwilling to engage in an exchange of words, but the fact of the matter is his bat and glove have done quite a bit of talking. Last season, Tex batted .351/.461/.662 against the Red Sox, and as yesterday’s three home runs can attest, he shows no signs of letting up. Curse in deed. In many ways, Mark Teixeira’s free agent signing represented a major shift in the balance of power between the two teams. By swooping in and snatching the switch hitting, slick fielding first baseman, Brian Cashman secured a centerpiece player in his prime to supplement an aging core. From the Red Sox perspective, the failure to close the deal with Tex has left several gaping holes. Had Boston been able to sign Teixeira, they wouldn’t have to worry about unloading the farm for the likes of Adrian Gonzalez or Lance Berkman. They also wouldn’t have had to concoct a run prevention strategy that locked them into Adrian Beltre. Teixeira’s presence on the Red Sox would have settled both the lineup and the infield defense…just as he has done for the Yankees. The net difference to both teams has been very significant, to say the least. Mark Teixeira is exactly the kind of players that the Red Sox need. His productivity (one team having it, and the other not) is one of the main reasons for the shifting fates of the two teams. No curse is to blame. That can be assigned to John Henry for not empowering his GM to bring Teixeira to Fenway. Now, the Yankees get to bring him nine times every season. Of course, if the superstitious in Boston insist on blaming the super natural, they can go with the curse of the Big Papi jersey. Ever since the infamous David Ortiz jersey was dug up from the foundation of new Yankee Stadium, not only have the Red Sox taken a step backwards, but Big Papi hasn’t been doing to well either.